When did you start running, and why? ​I started running shortly after the birth of my first Son in 2004. I mixed up running with going to the gym. But, I have to say, I wasn’t that motivated to do either. It was a feeble attempt at trying to keep fit and lose weight. After the birth of my 2nd Son in 2009 the gym and I parted company. I continued to run outdoors when I found the time, but I wasn’t very consistent. 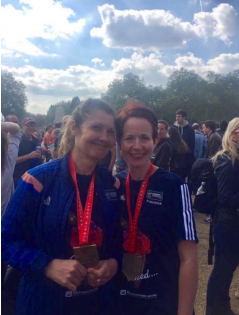 Then in 2011, and after a couple of glasses of wine, I talked myself and my friend Claire into entering the Leicester half marathon......and, so it began! The running, not the wine! What do you most enjoy about running? ​Since that first half marathon, I've taken part in many races, across many distances. And, I love running (most of the time!). I love the sense of freedom running gives me, and the time it allows me to think. I also enjoy the challenges running brings, particularly when taking part in races, be it setting a new distance, or improving pace, or tackling a new course. Another part of running that has given me a huge amount of pleasure has been getting involved with our club, both on the committee and as a Run Leader. It's been so rewarding watching the club grow, and seeing its members develop over such a short period of time. I've also made some good friends along the way. What is your favourite race/event? It just has to be the London marathon! Although I've ran in a number of great events, the atmosphere, and crowd support at London is something else. I'm so pleased that I finally got to do it. What are your top running tips? #1 – Trust in your training! If you put in the effort, you'll reap the rewards. #2 – Always wear sunscreen! #3 – Never eat steak before a race! It was 2 hours before an evening race I thought that this would be a good idea. ​I ran the London Marathon in April! I can hardly believe it but I have the medal so it must be true! I wouldn't have believed it was possible when I started running accidentally in 2013. A colleague was running the Watermead Challenge and I thought why not! I could hardly walk the next day but found myself wondering if I could have done better. I started running whilst the kids were at their various activities and noticed some of their friend's mums were in running kit too; we soon started running together and all became firm friends. Sarah Widdowson can take the credit for convincing me to enter the Leicester Half Marathon in 2014 and for dragging me round the course. If Team Anstey hadn't been born literally two weeks later that could well have been the beginning and the end of my running story. Joining Team Anstey meant that for the first time in years I was making time to exercise regularly and because of the social side I was enjoying it too! To top things off when the club started to race I was completely up for it, although when I say race mine was more of a timed run than a race as such that first year. However, when the second round of league races started I was determined to achieve 100% participation and some healthy PBs. This was going well until it all ground to a halt when I infamously fell down a hole in the grass and sprained my ankle whilst warming up at our first Gaddesby 7 race. It took 13 weeks to heal and it was during this time that I realised how important running had become to me, for both my physical and mental health and socially. When I had confirmation of my London Marathon place for Mind, the mental health charity, it seemed perfect. The number of runners I've met that run to help deal with the day to day stresses of life is huge, myself included. I often get told to go for a run if I'm in a bad mood at home! My marathon training plan was produced by the lovely Nikki Love, who assured me I could train without breaking myself and losing the love of running, and she was right. Although the training runs were long and sometimes lonely (not through a lack of willing running buddies I must add, but because of fitting them around work, children, a house extension and a life outside of running) I never dreaded setting off. Amazingly I discovered that you can run 14 miles without actually leaving Anstey - other runs were more exciting...who can forget a flashing motorcyclist! 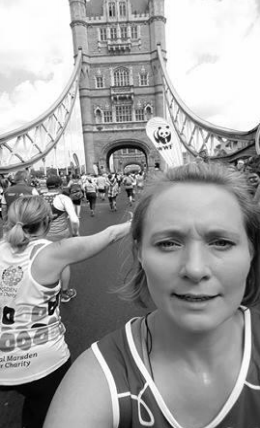 The London Marathon was an amazing, once in a lifetime experience. It has proven to me that outside of my comfort zone isn't such a bad place to be and that I should step outside of it more often!